To say that Marc Gasol is underrated might be a huge understatement. The seven-footer from Spain is the younger brother of Pau Gasol and has been one of the top centers in the league for several years. Despite this, collecting interest is relatively soft for Gasol. The small market of Memphis does not help his collectibility, but a deep run in the playoffs could put Marc Gasol on the mainstream hobby map and allow his limited rookie card options to take off. 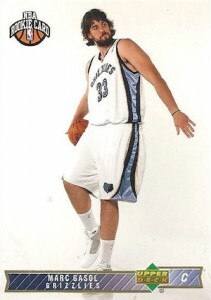 Shop for Marc Gasol cards on eBay. After starting his pro career with FC Barcelona, Marc Gasol was drafted late in the 2007 NBA Draft by the Los Angeles Lakers. While he did not play in the NBA that first season, his rights were traded by the Lakers to the Memphis Grizzlies in 2008 as part of the deal that brought Pau Gasol to Los Angeles. Widely considered one of the most lopsided trades in league history at the time, it does not seem so crazy now that Marc Gasol has the Grizzlies regularly in the playoff hunt and Pau Gasol is no longer with the Lakers. In addition to being the only brothers to ever be traded for one another in the NBA, the Gasols are also the first brother tandem to square off in an All-Star game as starters. Marc Gasol is a two-time All-Star and was also named the Defensive Player of the Year in 2013. From a collecting standpoint, Los Angeles would have been a much better location than Memphis, but Marc Gasol has carved out a devoted group of collectors. 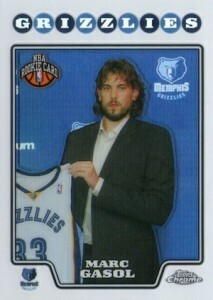 Unlike many of his elite contemporaries, key Marc Gasol cards are very limited. In addition to just a handful of rookie cards, Marc Gasol autographs are not easy to find. This issue is further amplified because many of his "available" autographs were actually never made. The most plentiful signed options appear to be found in 2010-11 products. Also, because of this relative autograph void, his relic cards take on added significance and can produce good values. 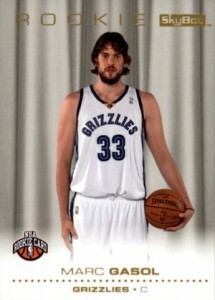 The following guide looks at all the available Marc Gasol rookie cards, as well as notable pre-rookie cards. A rather unlikely spot to find an early Marc Gasol card, 2007 Donruss Elite Extra Edition Baseball included a wide variety of subjects that were not limited to just baseball players, including coaches and Olympic athletes. 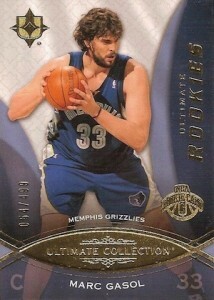 One featured group was the 2007 NBA draftees and the product marks the first opportunity collectors had to track down a Marc Gasol card. Starting what would be a trend with Gasol, his autographed card was apparently never produced, so collectors only have a few unsigned Status and Aspiration parallels to collect. 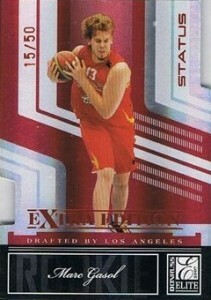 Another card that pre-dates his official rookies, 2008 eTopps offers a somewhat limited Marc Gasol card that could easily fit in with the other base rookies available based on the NBA focus. 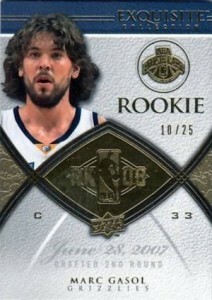 While Marc Gasol was intended to be included in the autographed rookie subset for 2008-09 Exquisite Collection, the card was never made and all that remains is the unfilled redemption cards. 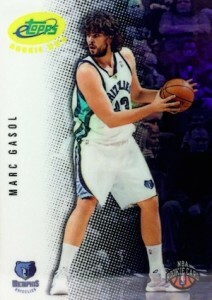 However, a rare unsigned Gold parallel was included in packs and these very rare cards, numbered to 25, are considered the top rookie option available for Marc Gasol. The same thing happened with his 2008-09 UD Radiance autographed rookie cards, but no unsigned versions were made available. Fairly plain for a Skybox offering, these simple rookie cards from 2008-09 can be found for cheap. There is a Ruby parallel, numbered to 50, that offers more rarity. Metal Universe inserts were also available in the same product for Marc Gasol and the colorful PMG parallels are a popular option for collectors. Generally the easiest card to track down, Marc Gasol's Topps Chrome rookie is made even more appealing thanks to multiple Refractor parallels. Ultimate Collection is normally a step above the base products and this 2008-09 Marc Gasol rookie features a refined design and mid-level print run. The retro feel of 2008-09 Upper Deck Lineage is even more low-key due to the large amount of white in this Marc Gasol rookie card. There is also a Special Edition parallel available that is more like a variation since the image and design is different.